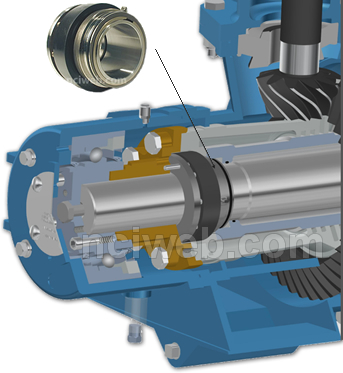 The JENSEN Type "F" Mechanical Seal is an integral part of every Series 600 Mixer. It is designed for long life at low cost. Materials of construction were especially selected to suit petroleum applications. When the Mechanical Seal is replaced, the shaft is sealed at two points. In addition to the locking seal an O-Ring Seal (A) just inboard from the seal is engaged. This minimizes product loss during seal change and acts as a backup for the main locking seal. The Mechanical seal area is completely enclosed for protection from rain, dust, freezing temperatures and other undesirable conditions. A drain hole (B) is provided for seal leak detection.